"An inscription on a stone let into the wall of the Tennis Court, gives 1673 as the date of James Street. The Tennis Court is, however, older, and appears to have formed part of Piccadilly Hall, a celebrated gaming house established about 1635...The insertion of windows in the lower part of the structure, and the glazing of the openings above, has destroyed much of the character of the building, which, however, still shows the main lines of a Tennis Court like that at Hampton Court. 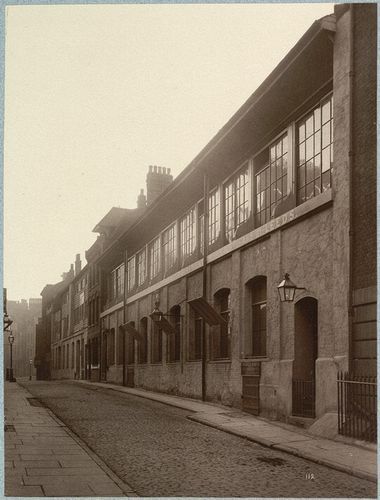 The building was used for its original purpose up to 1867 or 1868, after which it came into the occupation of the firm of army clothiers, who still carry on business here....The timber-fronted building in the distance, separated from the Tennis Court by a small brick house, is still known as 'the Barn.' It is, very probably, another relic of the glories of Piccadilly Hall."